awarded with an “OPUS Klassik” 2018! 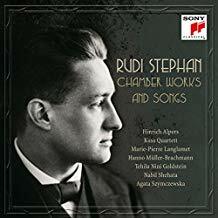 When Rudi Stephan (1887 – 1915) tragically died in the midst of the Great War, only 28 years of age, music history lost one of its most promising young aspirants of the beginning 20th century. Hinrich Alpers has been an avid lover of this fascinating music since he was a teenager. Stephan’s small surviving ouvre, walking a thin line between late romanticism, early modernism and impressionism can be considered most impressive for a German composer at the turn of the century. The Kuss Quartett, Hanno Müller-Brachmann (baritone), Tehila Nini Goldstein (soprano), Nabil Shehata (double bass), Marie-Pierre Langlamet (harp) and Agata Szymczewska (violin) have enthusiastically joined forces with Hinrich Alpers for this recording which has been awarded with one of the first “OPUS Klassik” prizes of 2018. Hinrich Alpers hast been thrilled by Ravel’s world of sounds since his childhood, when a French teacher introduced him to the world of piano. At the same time, Ravels eminence as a piano composer can hardly be overrated. Hence, Hinrich Alpers has added a few Hommages to this much praised album, “Postcards to Ravel”, two of which are from Ravel’s time and four have been specially composed. 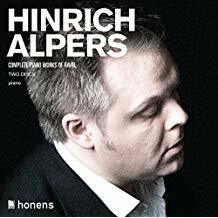 Hinrich Alpers’ debut CD features three works by Schumann which are entirely different from one another. The German Romantic composer created a number of works seemingly governed by a bipolar aesthetic, abruptly ranging from frantic impulsions to mournful moods. His Kinderszenen, thirteen miniatures explicitely conceived not as music for children but “from a grown-up for grown-ups”, are framed by two of his most substantial and epic works: the Faschingsschwank aus Wien, a picturesque cycle of five humorous movements about Viennese Carnival and the f sharp minor Sonata, a work full of youthful enthusiasm. “We want to tell you a love story …” The story of a couple that wrote each other touching letters over a span of four decades, that cursed each other only to reconcile passionately. The love letters of George Bernard Shaw, the celebrated author, and the actress Stella Campbell made worldwide success in Jerome Kilty’s stage version – now available as audiobook starring Mario Adorf and Iris Berben.